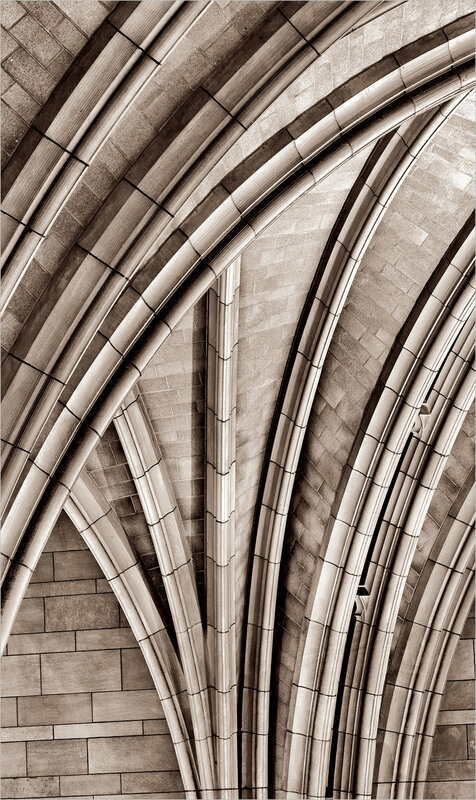 When I was thinking about what to title a post with another photograph of the ceiling of the Cathedral of Learning, the first thing that popped into m,y head was “More Ceiling”, which was reminiscent (if you are old enough to remember) of “More Cowbell”. If you aren’t old enough to remember then you can give yourself a treat and visit a classic SNL skit just below the photo! And see here for more info on this truly classic SNL skit! Meanwhile…..back at The Cathedral of Learning, I wandered down another hallway. This one was a bit unusual in that it ended in two windows, which is a bit different from all the others I had wandered down. Yes, yes, it’s another image from the Cathedral of Learning. I had previously mentioned that shooting there has become ‘a thing…..a project’. I had never been to this side of the building before and was fully expecting more hallways similar to the last couple that I posted. But when I ran across this scene, complete with table and bench with mystical looking light coming in through the window and shaped by the curved ceiling, my first thought was ‘this looks like something out of Harry Potter’. So there you have it, a study hall at Hogwarts! 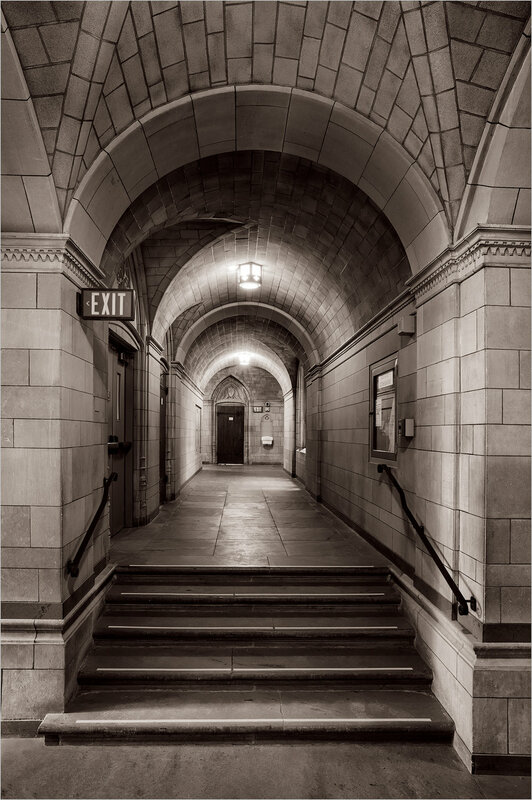 Of course one could say it’s just another hallway at the University of Pittsburgh’s Cathedral of Learning, but the hallways all seem to have a different character to me. 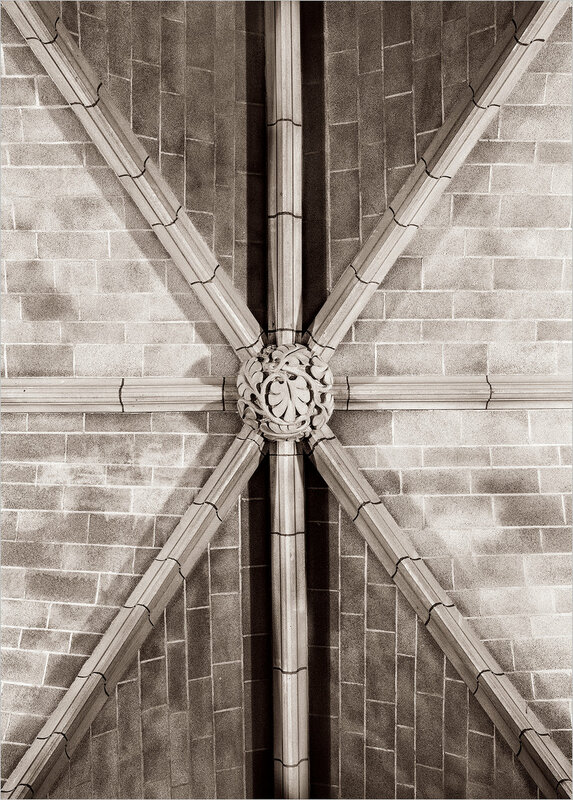 This installment of my Cathedral of Learning project (yes, it’s become that) is an abstract image of shapes and lines from the ceiling of the Cathedral. The ceiling is so high that it actually required my 100-400 zoom to isolate this segment of it. In addition to the lines, there is also an interplay of tones because the small lights and windows tend to illuminate the ceiling harshly in some places and much less so in others. I smooth out some of this in post processing in order to obtain a more pleasing look. The Cathedral of Learning is an open and public area, but when I go there on Sunday mornings there usually aren’t many people there. Nonetheless, it is a place where students come to study. I know that photography is allowed, as my friends have asked, and there are frequently security officers around who have never hinted otherwise. I was intrigued by the idea that there were people using laptops in this environment that seemed so ancient. I’m sure that when the structure was built there was never any idea of anyone studying here without books! I’ve gotten to processing the last close up photo of the carved wooden hand rest on the first floor bench at the Cathedral of Learning. Now it can serve as a triptych with the other two characters. There was actually a fourth carving, but that one has become a bit damaged over the years. This one looks like he is in a state of dreamlike euphoria! 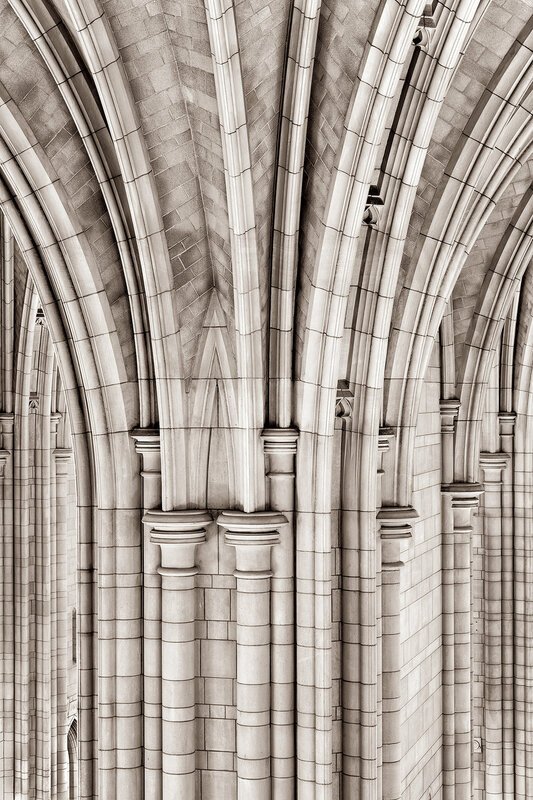 My photographing at the University of Pittsburgh’s Cathedral of Learning has moved from a random place to make photos, to a series, and I suspect is now a full-fledged project. I made this particular photo because I liked the way that the lights seemed to illuminate the column while also throwing a circle of light on the floor. The whole scene seemed to look fairly mysterious to me, particularly with the two arched and dark doorways in the background. 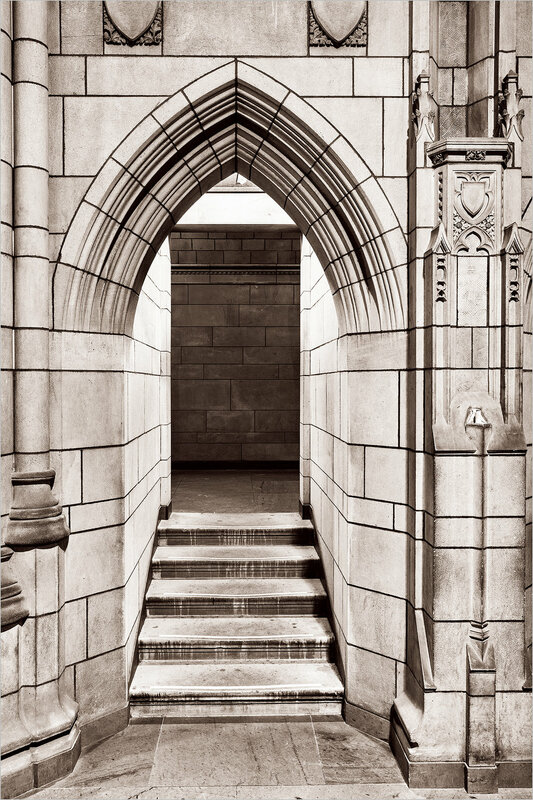 Most of the photographs I have taken at the Cathedral of Learning have been of large subjects: rooms, arches, hallways and doorways. But the last time I was there I ran across some small details that cried out to be photographed. On the first floor there is an old wooden bench I found that had hand rests, with each one ending in a carved wooden caricature with varying tonality based on the grain of the wood. It was an interesting change from what I had been photographing while there before, and I found myself wondering what those caricatures would have seen over the years had they been ‘alive’. The Cathedral of Learning has quite a few hallways that are lit with old fashioned incandescent lights. In this particular hallway, I was drawn to the zebra-like stripes of light and dark that the lights made on the wall. The emptiness of the hallway also gave me a bit of a ‘spooky’ and lonely feel that I tried to transmit in the image. It definitely looks like the Cathedral is turning into a small project! Two more of the University of Pittsburgh’s Cathedral of Learning photos are included in this post. The first is a new image and the second is one I have posted before, but it has been reprocessed. I had previously posted the next photo as an example of color grading, but it was presented as a blue toned image. This version is sepia toned to fit in with the presentation of the other Cathedral images. Over time there will be more to come!